With that simple but profound philosophy — and the right application of thought — you can overcome obstacles, reach goals, improve health, and achieve serenity. Since its initial publication a century ago, millions around the world have responded to James Allen’s powerful message of positive thinking and have used it to achieve their maximum potential. 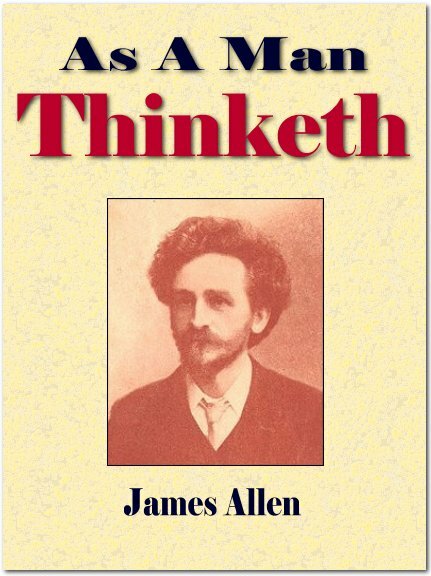 As a Man Thinketh is without doubt a masterpiece; a short but concise and highly insightful book that holds powerful secrets to the challenge of successful living – every bit as relevant today as it was when it was first written. Every page of the great book is packed with timeless wisdom. The book has a whole contains a universal system for successful living. The more times you read this wonderful little book, the more great wisdom you will find packed within its short pages. As you continue to study that wisdom, a formula for successful living will gradually become apparent to you. One component at a time it will emerge until you can piece all the different bits together into a formula that anyone can follow. The rich insights in the book apply to every person in every situation. There are no exceptions.We have distilled down the many steps, spread across every page of every chapter of the book and put them into a simple system. We have then worked from the system back to reference the text from which it was drawn out. Contact me HERE if you would like to be added to the list for the next start date of this study.